Have you ever colored a mandala? I first learned what a mandala was years ago when I was in a therapy session working on some issues (we all have them, right?). The woman suggested I get some of these large geometric figures and either paint or color them as a way to relax. 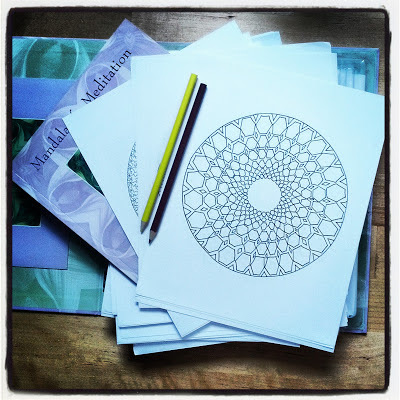 It sounded so appealing I went straight to the bookstore and found Mandalas for Meditation, a big kit with coloring pencils, blank white mandala shapes, and a book delving into how to use them for meditation. As the back of my book puts it, "Color the fascinating, varied patterns of mandalas as a wonderfully soothing form of meditation. Achieve an inner calm and focus on what's essential, skills that we often lose in times of crisis. Practice following set patterns, create order within yourself as you accept the orderliness of the mandala, and gain perspective on what really matters in life. Whatever hues you choose are fine- the end result will always be perfect. When you're coloring, you're embarking on a personal path, experiencing things differently than anyone else." You can draw your own mandala, find some online to print, or even look for a book like the one I found to start your mandala journey.